Metal detecting in New Hampshire follows the ARPA (Archeological Resources Preservation Act). Be sure and click on the link below for the ARPA explanation and some of the problems people face who break this law. People who are metal detecting are being arrested for digging in areas that are off limits. The areas you should be concerned about are State and Federal lands. There are two main laws that explain the removal of artifacts on those lands. I explain each briefly, and provide links to more information. Do Not Break The Law! The laws were written to protect relics on Indian lands. But unfortunately they broadened their scope to include any artifact more than 100 years old. Do not dig anything that you believe is an artifact, or anything that is older than 100 years. Especially if you are on any State Lands. Many have said to me that they are tired of the laws that restrict us from metal detecting, and they are ready to quit the hobby. I tell them if they do, then the beauracrats who make these laws, and the Archaeologists who defend them, will win. If you happen to be thinking this way understand that for many years we have had these laws, and the hobby is still going strong. Metal detecting on private property does not come under the above laws. For detecting in New Hampshire, town, village and city parks, you'll need to check with those local officials. 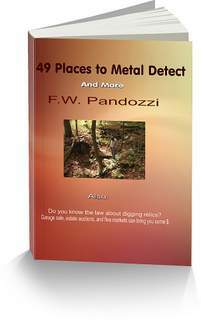 Have you tried metal detecting in New Hampshire ghost towns? Remember, don't give up the hobby because of a few laws. There are still many places to detect.